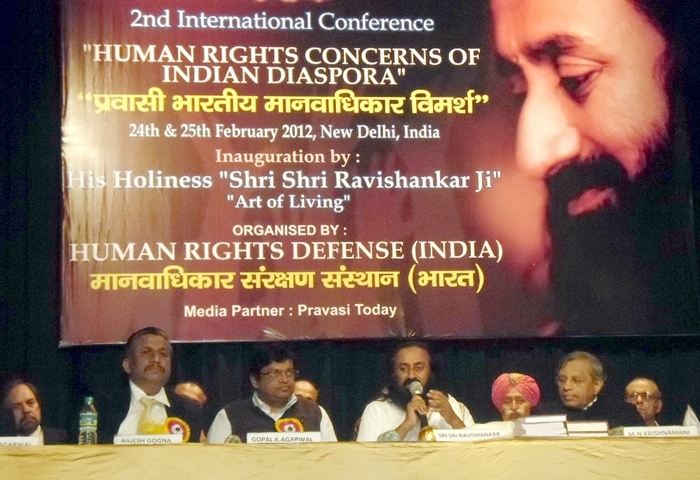 Shri Shri Ravishankar ji addressing the delegates of the 2nd International Conference on Human Rights Concerns of Indian Diaspora held at Hindi Bhavan, New Delhi. This two days conference was organized by Human Rights Defense(India). On this occasion, Well known Advocate A.S.Chandhok, Human Right Activist-Dr.Richard L. Benkin, Solicitor Karim Assaad from U.K. shared their views on Human Right issue. Mr.Gopal Aggarwal informed Dwarka Parichay that the 3rd International Conference on Human Right would be held on 5-6th January,2013. Pravasi Today-popular & informative international reputed monthly magazine is the Media Partner of the Conference.